Devi Mahatmya, or Devimahatmya, which means the glory or the majesty of the Devi, extols the greatness of Durga in 700 Shlokas. It is found in the Markandeya Purana – Chapter 81 to 93. 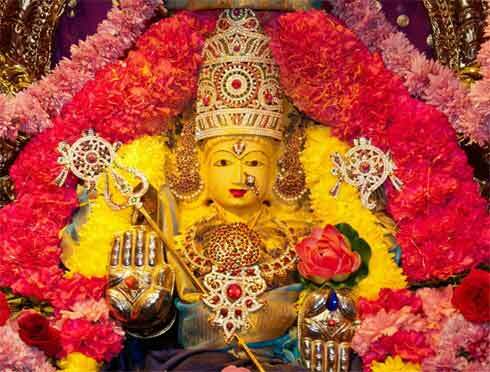 As it consists of 700 hymns, Devi Mahatmyam is also known as Durga Saptashati. Also referred as Chandi Patha or Candi Path, it details the exploits of Mother Goddess in her three major forms – Maha Kali, Maha Lakshmi, and Maha Saraswati, which symbolically represents strength, wealth and wisdom. Devi Mahatmya is daily read in temples dedicated to Durga and is read by devotees during Navratri. All the narrations associated with Durga in different regions follow Devi Mahatmya. In Devi Mahatmya, Shakti the female energy is the principal deity – ultimate source of all creation – Brahman the core concept of Santana Dharma is realized in female form. In the first part of Devi Mahatmya, Mahakali or Yoganidra, is the power that causes the deep sleep of Vishnu on the waters of the cosmic ocean prior to creation. Vishnu wakes up only when she agrees to withdraw and then he destroys Madhu and Kaitabha and the creation begins. In this form, Mother Goddess symbolically represents the ‘Tamas’ attribute. The second portion of Devi Mahatmya is the most popular one and it describes Durga’s destruction of Mahisha. Durga in this form is the recipient of the valor and strength of all gods and she kills demon Mahisasura. In this form, She embodies the ‘Rajas’ attribute. In the third part, Durga kills demon brothers Shumbha and Nishumbha. In this form, She embodies the ‘Sattvic’ attribute.